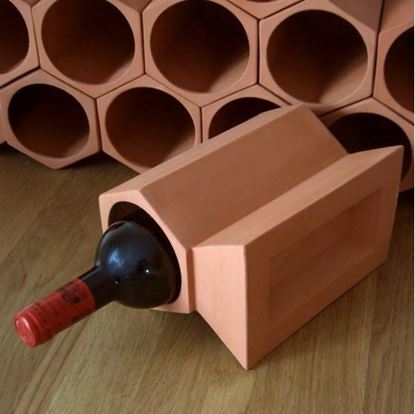 Our English terracotta wine racks are all made at our pottery in Newark, Notts, using durable Terracotta clay from Staffordshire, & with each one finished by hand, quality is priority. 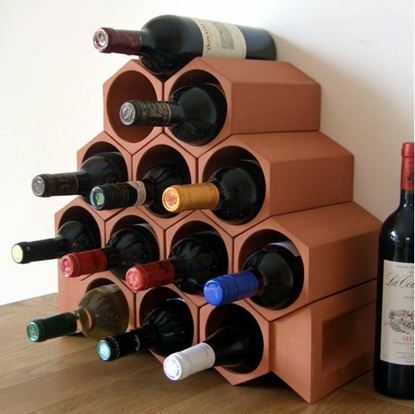 A Natural Choice for Wine Storage, terracotta is a practical and versatile material offering flexible solutions with natural benefits. 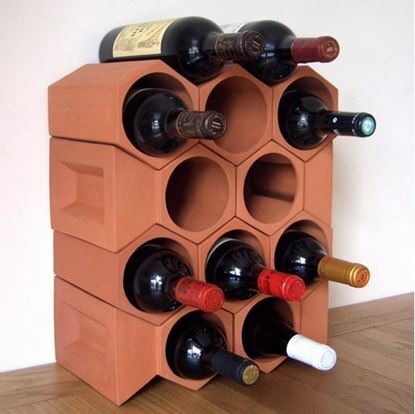 Natural Beauty & Properties: As well as natural beauty, terracotta also offers natural physical properties which make it the perfect choice for serious wine collectors. Used to store valuable collections for centuries, terracotta will not deteriorate in cool humid cellar conditions, & will help to maintain ideal temperature & humidity by reducing fluctuations. 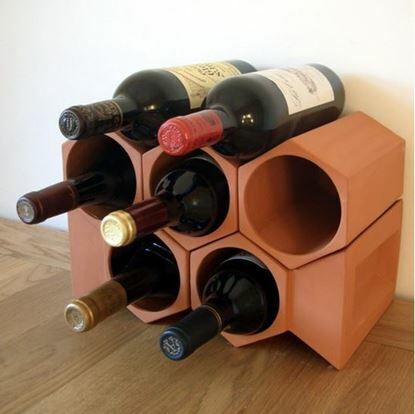 From wine racks to wine cellars: These individual hexagonal wine rack sections have been designed to simply stack together into a honeycomb format of any shape or size. 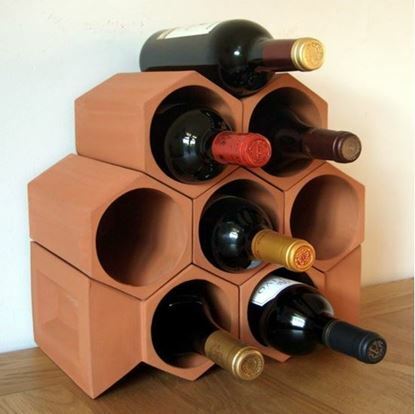 From a free standing wine rack, to a tailor made feature wine rack or cellar wall. 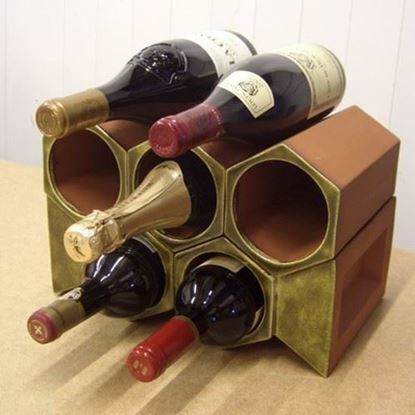 Key Stones allow greater flexibility & stability: Our original “Key Stone” sections can be used in conjunction with the individual wine rack sections to make free standing wine racks of all shapes & sizes. Functioning like the keystone in a bridge these Key Stone sections have been designed to tie in with other sections allowing even greater flexibility & stability, resulting in a sturdy, self-supported assembly which can be positioned almost anywhere, from pantry shelf to pride of place on your worktop. 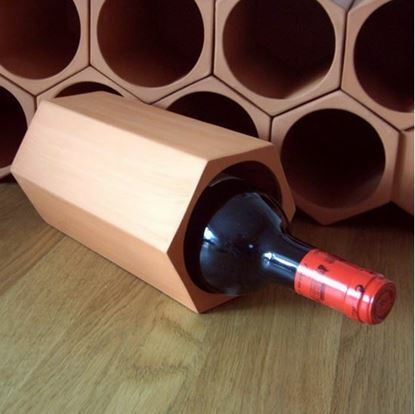 Now you can design your own wine rack to fit your available space. (Individual sections can be supplied in any number). If you need to fill a specific space or just want to go bespoke, then please CLICK HERE for our PDF width & height calculator, which will enable discover the best fit & exactly how many units you will need. Glazed Ends: Coloured glazed hexagonal ends for that added 'Chic' - Colours include: Olive Green or Ochre. 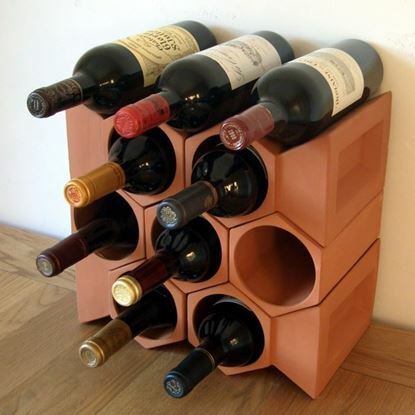 Each wine rack unit measures approximately 19cm in depth, by 10.5cm (flat-side to flat-side) or 12cm (point-to-point) in width. Wine rack units can be stacked either on their pointed edges or alternatively, with their flat sides facing down, allowing more versatility for filling any given space. Whether you are looking for a freestanding 10-set wine rack or something larger, these practical and versatile units can be supplied in any number. 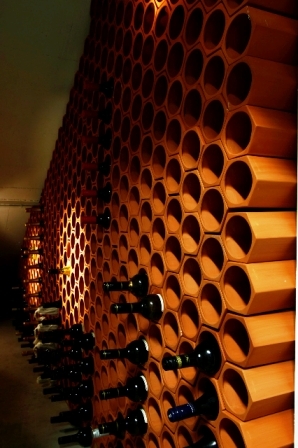 CLICK HERE to read wine rack & wine cellar testimonials from our satisfied customers. Wine Racks 'Down Under' - the picture on the right kindly supplied by our Australian customer Richard, who installed this impressive (700-unit approx) wine rack in his garage, which is our furthest travelled wine cellar to date. 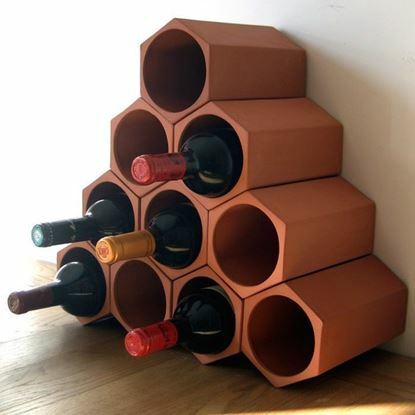 Numerous terracotta wine racks fitted within a brick fireplace, see photo on left. Plus numerous awkward spaces which have now been filled in untold kitchens, including neatly-fitted racks within the 'standard' kitchen units themselves!